Dec. 4, 2009 -- Ryan Beaird, a senior from Sikeston, Mo. 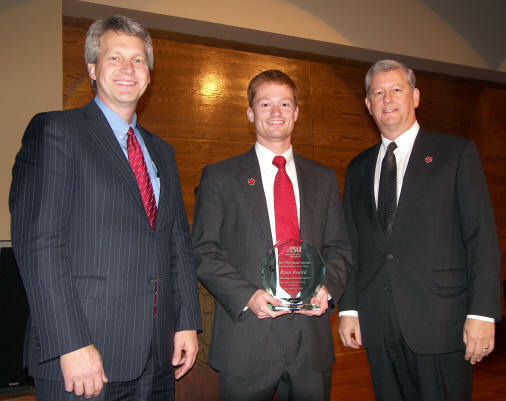 and two-term president of Arkansas State University’s Student Government Association, has been selected to receive the Outstanding Who’s Who Award for 2009. Beaird was chosen from 50 ASU students who made the list by the nationally recognized Who’s Who program. (Pictured from left) Len Frey, dean of ASU College of Business; Ryan Beaird; Randy Luten, Crews and Associates in Little Rock. Who’s Who Among Students honors outstanding student leaders who enhance the positive image of American youth through contributions to community and school. Significant academic achievement and involvement in extracurricular, civic, and student professional activities are attributes of students selected for Who’s Who recognition. Beaird, a business management major who will graduate with a bachelor’s degree in May 2010, will receive $500 from Crews and Associates investment bankers in Little Rock who donates the prize awarded to the outstanding recipient. He plans to work toward completion of a master’s degree following graduation. His academic achievements include receiving the Most Outstanding Junior Award for Achievement in Business Excellence as well as achieving membership in the Beta Gamma Sigma International Honors Society for Collegiate Schools of Business and the Chancellor’s List. Beaird also received the Nedrow Scholarship and was the Convocation of Scholars College of Business Junior Honor Student. Among his professional academic activities, Beaird is a member of the ASU chapter of the College Republicans, the state chapter of the Arkansas Federation of College Republicans, the American Israel Public Affairs Committee, Shout America, and Focus the Nation. He also serves on the United Way of Northeast Arkansas Board of Directors, worked with the Jonesboro Jaycees Haunted House project, the Buddy Walk for Down Syndrome, the Chi Omega 5K for Make-a-Wish, and Invisible Children. In addition to being elected by ASU’s student body as the SGA president the last two years, Beaird served as the vice president and recruitment chair of the Inter Fraternity Council, vice president of Pi Kappa Alpha fraternity, serves on the Student Union Advisory Council and is a representative on the University Planning Committee. COLLEGE OF BUSINESS—Nicole Frey of Jonesboro (International Business); Seth Holifield of Paragould (Insurance); Kelsey Mitchell of Benton (Accounting); Kiel Smith of Forrest City (Accounting); and Justin White of Pine Bluff (Business Administration). COLLEGE OF COMMUNICATIONS—Jamie Beck of Rector (Communication Studies);Caitlin Berry of Sherwood (Journalism); Ashley Bowers of Marianna (Journalism); Anna Callaway of Warren (Radio-Television); Sarah Campbell of Gravel Ridge (Journalism); Tabitha Cooke of Little Rock (Radio-Television); Cecily Long of Little Rock (Journalism); Gabriel Rice of White Hall (Journalism); Jeffrey Sheppard of Peoria, Ill. (Radio-Television); and Ashton Snowden of Greenbrier (Radio-Television). COLLEGE OF EDUCATION—Shaquita Lee of Jonesboro (Exercise Science). COLLEGE OF ENGINEERING—Shawn Oates of Russellville (Engineering). COLLEGE OF HUMANITIES AND SOCIAL SCIENCES—Kayla Dean of Searcy (English); Sharnea Diggs of Little Rock (Political Science); Ashley Handcock of Pine Bluff (Political Science); and Dieresha Smith of Menifee (Criminology). COLLEGE OF NURSING AND HEALTH PROFESSIONS—Brandon Aven of Ogden, Utah (Nurse Anesthesia); Allyn Cohen of Germantown, Tenn., (Clinical Laboratory Science); Ashley Dabbs of Paragould (Social Work); Samantha Davis of Jonesboro (Nursing); Lauren Hancock of Mountain Home (Family Nurse Practitioner); Hannah McCone of Monticello (Communication Disorders); Sarah Mouser of El Dorado (Nursing); Laura Mumphrey of Jefferson (Nursing); Alexa Nation of Little Rock (Radiologic Sciences); Eureka Reed of West Memphis (Social Work); and Amber Woods of Batesville (Nursing). COLLEGE OF SCIENCES AND MATHEMATICS—Tyler Allen of Crawfordsville (Biological Sciences); Travis Bailey of Jonesboro (Biological Sciences); Brandi Brown of Gosnell (Biological Sciences); Natalie Cissell of Wilson (Chemistry); Laura Claussen of Pine Bluff (Biological Sciences); Whitney Collins of Jonesboro (Chemistry); Hillary Colvard of Wynne (Chemistry); Adrian Everett of McGehee (General Science); Morgan Fincher of Jonesboro (Mathematics); Janet Jamison of Monticello (Biological Sciences); Stephanie Myal of Fort Worth, Texas (Biological Sciences); Adam Skarda of Des Arc (Biological Sciences); Keith Wilcots of Hot Springs (Biological Sciences); Kimberly Winchester of Jonesboro (Chemistry); and Claire Woosley of Little Rock (Biological Sciences). UNIVERSITY COLLEGE—Nicole Dixon Stahl of Trumann (Interdisciplinary Studies) and Sommer Kirtley of Dumas (Interdisciplinary Studies).